It’s picnic season, and if you’re like me, you’re always looking for something new to bring to your next pot-luck. If you’re getting tired of cole slaw, potato or pasta salad, then try these easy potatoes. They’ll be a sure-fire hit at your next outdoor gathering. All you need is enough potatoes for your crowd. You can use either a white baking potato or a sweet potato – or both! Count one medium-large potato as two servings, and plan accordingly for the number of people you need to serve. The steps below are based on using 4 potatoes, or 8 servings. Tip: You can also use these as appetizers. If so, cut each half in half after grilled, then place on a pretty platter, with topping added. Step 1: Wash potatoes. Arrange potatoes on a baking sheet and put into a pre-heated 400 degree F oven. Bake for 45-50 minutes. Step 3: Prepare filling. Add 2 spoonfuls of Plain Greek Yogurt to the potato pulp, and gently combine. Add freshly ground black pepper – about 8 turns, or to taste. Add 1/8 teaspoon salt (optional). Add 1/4 cup of your favorite shredded or grated cheese (pepper jack, bleu, or cheddar work). Mix together well. Step 4: Refill potato skins. Fill each potato skin with a spoonful of the filling, distributing filling evenly between the potatoes. Sprinkle with paprika. (NOTE: you can complete steps 1-4 the day before the picnic. Place filled potatoes onto baking sheet or platter, cover potato halves with plastic wrap, and refrigerate. Go on to Step 5 on the day of party). Step 5: Prepare potatoes for grill. Preheat grill to medium heat. Place potato skins directly onto hot grill, and cook until skins are slightly crunchy on the bottom, and potato is heated through. Step 6: Add healthy toppings. Serve the potato skins with a variety of toppings – or if you’re bringing these to a picnic to grab and eat, top them before you go. Topping options: Black beans, freshly chopped chives, sour cream or plain Greek yogurt, chopped plum tomatoes, shredded cheese. Tip: For more pizazz, you can marble the white and sweet potato pulp together in Step 3. 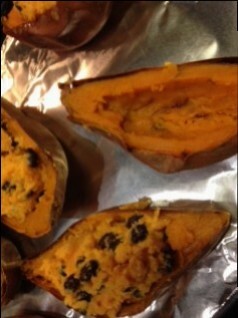 Bake 2 sweet potatoes and 2 white potatoes. Scoop out pulp into separate bowls and mix each filling separately. Then add the sweet potato mixture to the white potato mixture, gently cutting it through for a marbleized (not completely mixed) effect. Add this filling to each of the white and sweet potato shells. 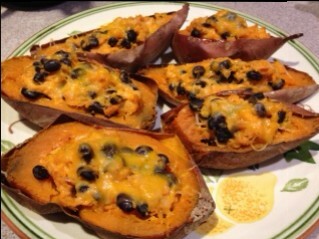 This entry was posted in DASH Diet/Wellness, Easy Cooking, Food Facts, Just for Fun, Misc, Weight Loss and tagged appetizers, easy potato recipe, eat right, healthy eating, healthy potato skins, picnic food, potatoes, stuffed potatoes, sweet potatoes by Rosanne Rust. Bookmark the permalink.